What to do if you're being bullied. What to do if you know someone who's being bullied. Questions or suggestions? Contact me! Pregnancy is when a woman is carrying a baby inside of her. A woman has to carry a baby because it is too small to look after itself and needs the mother for protein and nutrients. A woman is pregnant for nine months and those nine months are split up into three trimesters. In the first trimester the woman will notice she is pregnant because she will notice she is missing her menstrual period. This can be confirmed with a blood test from the doctor or by a home pregnancy test that can be purchased from the supermarket. It's a plastic stick the woman urinates on and it changes colour depending on if she's pregnant or not. She may also experience morning sickness (vomiting), cravings (the urge to eat a specific food) and mood swings. During the first the trimester the fetus (unborn baby) will develop most of it's vital organs and begin to grow eyes, nails and earlobes. The mother will also begin to show a baby bump. By the end of the first trimester the baby will look a bit like this. During the second trimester the baby's gender can be determined with and ultra sound (a machine used to look inside your body. 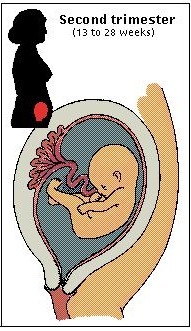 It's used to check the health of a baby during pregnancy). The baby will also form bones, learn to make facial experssions, accumulate fat and begin to hear. 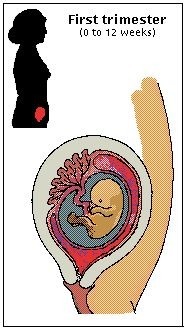 This is what the baby will look like during the second trimester. During the third trimester the main aim for the baby is to grow and gain weight so it has a better chance of survival once it's born. It will also open its eyes, practice breathing and be able to detect light. 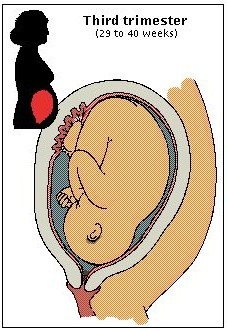 An important thing that happens during the third trimester is that the baby flips over so its head is facing down. It does this to prepare to be born, it's easier when giving birth if the baby comes out head first that way its arms and legs won't get stuck. After nine long months of pregnancy it's finally time for the baby to be born, this is called going into labor. It begins with contractions which happen because your uterus is ready to push the baby out. They are very painful for the mother, much like period pain but on a larger scale. The contractions start quite far apart and grow closer together. The uterus will also dilate (open) and once it's 10cm (4 inches) wide the woman will start pushing to give birth to the baby. This normally takes place in a hospital so that if there are any complications (things that go wrong) a doctor is there to help, although some women do decide to have home births or water births where they give birth in a tub. If there is a complicatation for some reason and the woman cannot give birth to the baby an operation called a caesarean is preformed. In this operation the surgeon will cut through the skin to the uterus and take the baby out. Most of the time however women give birth naturally. They often lie in this position to push the baby out. The woman pushes with her contractions, that keep getting more frequent, until the baby is born. There is a pain reliever called an epidural the woman can have before she starts giving birth. It's an injection that goes into her back and numbs her from the waist down. It cannot be used during birth because she would not know when to push. When the baby is first born it is cleaned from all the mucus and the umbilical cord, which supplied the baby with food from the mother through the pregnancy, is cut and tied to form your bellybutton. Now this is the part breasts tie into it. When the baby is little its immune system isn't working at it's full potential so it needs a special milk. This milk comes from the mothers breasts. While she was pregnant she started to produce milk in her breasts so that she would be able to feed the baby. Breast feeding usually happens during the first year of the baby's life until it can switch to solid food and cows milk.